This ammunition is produced by Italian manufacturer Fiocchi Munizioni, one of Europe’s largest and oldest ammo manufacturers. Fiocchi handgun loads are used by military and law enforcement agencies around the world. Combining the best of Italian style with the best of American innovation, Fiocchi brand ammunition is excellent target ammunition available at an excellent price. 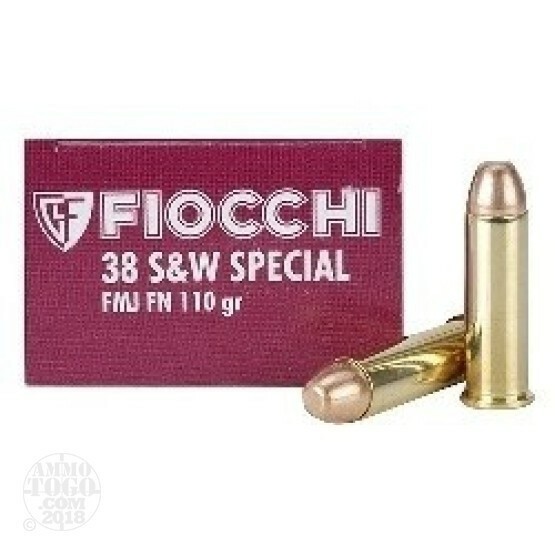 Perfect for the high-volume shooter, this package contains a full 1000 rounds of Fiocchi .38 Special ammunition. Each cartridge is loaded with a 110 grain full metal jacket flat nose projectile. These projectiles punch perfect holes in paper targets, making them an excellent choice for realistic practice. Manufactured with quality components measured to produce consistent and reliable performance and accuracy, these economical FMJs allow a seamless transition to personal defense rounds with virtually no change in point of aim or impact. This ammunition is factory fresh, non-corrosive, boxer primed, and features high quality, fully reloadable brass cases. Loaded to +P internal pressure, these rounds are designed to deliver enhanced velocity and stopping power. Each round leaves the muzzle at a velocity of 1080 feet per second with 284 foot pounds of energy. Depending on the make and model of your handgun, +P ammunition may not be recommended. Be sure to check with the manufacturer for more details concerning use of overpressure ammunition.